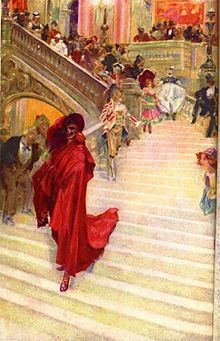 The Phantom of the Opera (French: Le Fantôme de l’Opéra) is a French novel by Gaston Leroux. It was published in 1910. An English edition came out a year later. The book was adapted to a musical by Andrew Lloyd Webber in 1986. The musical was made into a movie in 2004. Movie versions include one starring Lon Chaney in 1925, one from 1943 with Claude Rains, another from 1962 with Herbert Lom, and The Phantom of the Paradise (1974). The story has been adapted to made for television movies several times. This page was last changed on 2 September 2018, at 17:07.